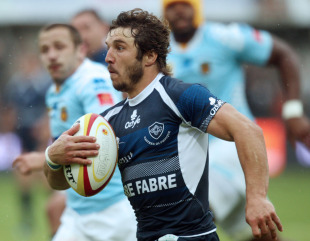 Winger Alexis Palisson has withdrawn from France's tour of New Zealand next month after injuring his hand. The Toulon winger confirmed he needs an operation on his left hand, halting his return to international rugby after last representing France three years ago. Marc Andreu will replace him in the 35-strong squad. The French have already lost prolific point-scorer Morgan Parra, who has been ruled out after aggravating a thigh problem. Parra's place in the tour squad goes to Toulouse scrum-half Jean-Marc Doussain, 22, whose only Test cap was as a late replacement in the IRB World Cup decider. On the other side of the ledger, the All Blacks look to have lost Crusaders lock Sam Whitelock, out for between 4-6 weeks after fracturing a finger in last week's 28-19 loss to the Chiefs. France play Tests in Auckland, Christchurch and New Plymouth as well as a match against the Blues on June 11.